Bill Titus at Northrop & Johnson tells me he's sold the 34.4m raised pilothouse motor yacht Capricorn to a direct client. Designed by Jack Hargrave and built by Hatteras in 1991 to ABS class, she had a full $1.6 million refit in 2011 and accommodates eight guests in four staterooms with a full-beam master suite down a private staircase, a VIP stateroom on the main deck and two twin cabins below. Twin 2,250hp MTU engines give her a cruising speed of 18 knots and a range of 2,000 nautical miles. 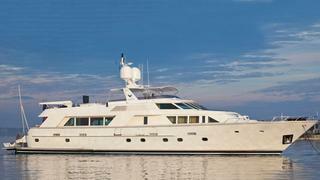 Capricorn was asking $1,349,000 and is renamed Victoria.